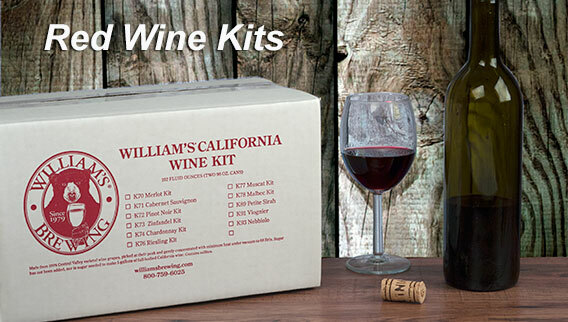 Craft your own delicious wines with William’s winemaking kits! Making your own wine is satisfying and easy. As long as you ferment quality juice, keep everything sanitary, and give it enough time to age (3 months or more for whites; 6 months or more for reds), you will get great wine. Here at William’s, we have developed our William’s California Wine Kits with this philosophy in mind. Our Winemaking Kits include 192 ounces of pure California varietal grape concentrate, condensed at temperatures that never exceed 180 degrees fahrenheit from Central Valley wine grapes picked at their ripe peak in the late summer and early fall. To complement the varietal juice, specially selected dry wine yeast, oak chips, and nutrient are also included as needed. Unlike many wine kits featuring added sugar, this 192 ounces of pure concentrate is all that is needed (except for the yeast and additives) to produce 5 gallons (or, about 24 bottles) of varietal wine. Our white wine kits come in options such as muscat, riesling, and chardonnay. 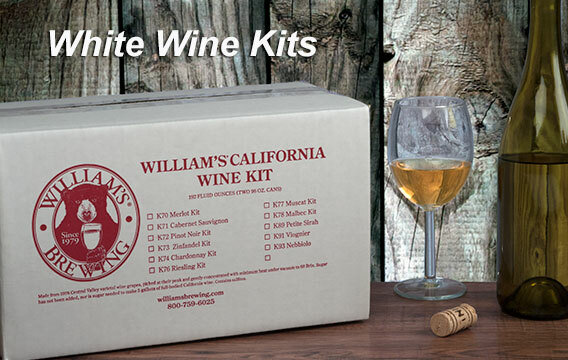 Our white wine kits still take a few months to age properly, but by in large, take less time than our red wine kits. Our red wine kits also come in a variety of options ranging from merlot to malbec to zinfandel. These generally take 6 months or longer to age properly. 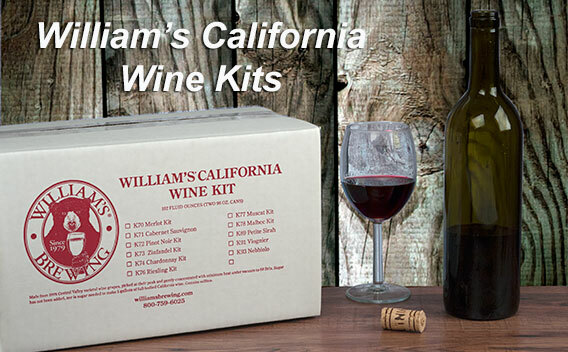 William’s Brewing winemaking kits provide you with just about everything you need to make delicious wine, but don’t forget bottles!